Until now, we knew (officially) that an unnamed successor to Windows 8 would enter Release Preview testing next month at Microsoft Corp.'s (MSFT) BUILD Conference. Now that unnamed release has received an official title. At JP Morgan & Chase Comp. 's (JPM) Media and Telecom conference today Windows chief financial officer Tami Reller confirmed rumors that the upcoming OS, codenamed Windows Blue, would be christened "Windows 8.1". More importantly, the update -- which reportedly will allow users to boot to desktop, return some semblance of the Start button (albeit one that dumps users into Metro), and include better mouse support in Metro -- will be offered for free to Windows 8 customers. The update will be distributed via the Windows Store. OEMs are hopeful the update will revive floundering PC sales. Q1 2013 marked the worse percentage drop in PC unit sales in history. Tami Reller yet again addressed Microsoft's sentiments on another key topic -- Windows RT. Samsung Electronics Comp., Ltd. (KSC:005930), The Lenovo Group, Ltd. (HKG:0992), Dell Inc. (DELL), and Acer Inc. (TPE:2357) -- have attacked the OS  have all attacked complaining about its lack of legacy compatibility and Microsoft's poor marketing of the platform. 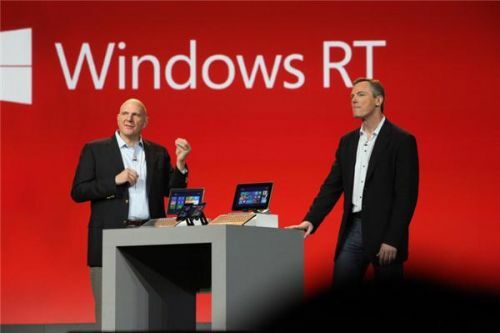 Many of these OEMs have refused to release Windows RT products, sinking sales to an anemic 200,000 tablets in Q1 2013. But Microsoft, like its hardware partners Qualcomm, Inc. (QCOM) and NVIDIA Corp. (NVDA) , is standing clearly behind the platform. In a statement at the conference Ms. Reller stated, "We need the flexibility of ARM"
There may be relief in sight for Windows on ARM (WOA), aka Windows RT. One of the improvements Windows 8.1 is expected to bring is UI adjustments to accommodate 7- and 8-inch displays. The explosion of this lower-priced segment helped propel another struggling tablet platform -- Google Inc.'s (GOOG) Android -- from a bit player to a serious contender, with designs like the Samsung Galaxy Tab, Amazon.com, Inc. (AMZN) Kindle Fire, and ASUSTek Computer, Inc. (TPE:2357) Google-branded Nexus 7 tablet. There's not much Microsoft can do about the legacy compatibility issue, other than to try to foster the growth of ARM-compatible apps in the Windows Store. But hopefully Microsoft improves its educational efforts, both in general on how to use Windows 8 (for new users) and the differences between Windows 8/8.1 and RT (for potential ARM device buyers). Microsoft is standing behind its ARM product, looking to new form factors. Render time: 0.241 cpu sec (56.00% load, 0.005 startup). Clock: 0.43 sec (13% of that for queries) DB queries: 35.